I don’t give my sister a gift for my neighbor’s birthday. Nor do I buy my husband a gift when it’s time to gather friends to celebrate my best friend’s day of birth. So why do we give each other gifts for Jesus’ birthday? In our family, we believe in the spirit of giving as a way to share the gratitude for the love Christ has given to us. In other words, we are so thankful for Christ’s birth that we want to share the joy by giving to others. This includes our children. 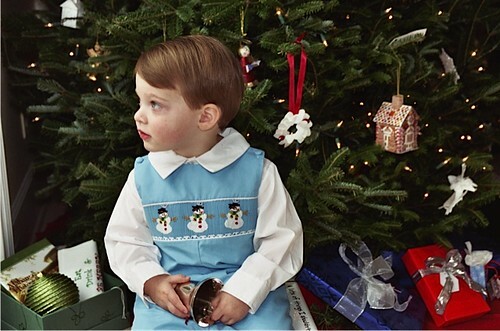 However, it is hard for our children not to get hijacked by Santa Clause. 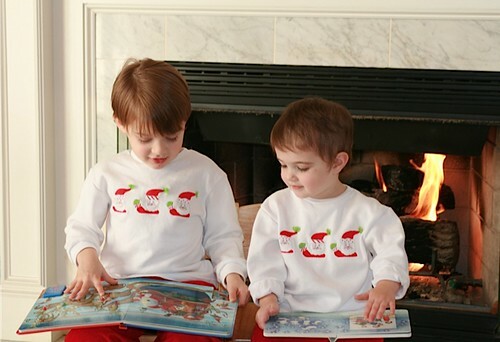 Of course we participate with Santa also, but we don’t deviate far from our values by asking our children to request only one gift from Santa. 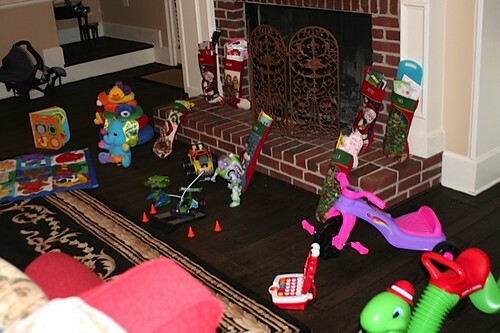 And, we tell them, in return, Santa will leave three gifts for them. There are gifts in the story of Jesus’ birth: the three wisemen each brought a gift to the baby Jesus. If three gifts were enough for our newborn savior king, then three gifts should leave us plenty thankful, too. The next year he was old enough to make requests. 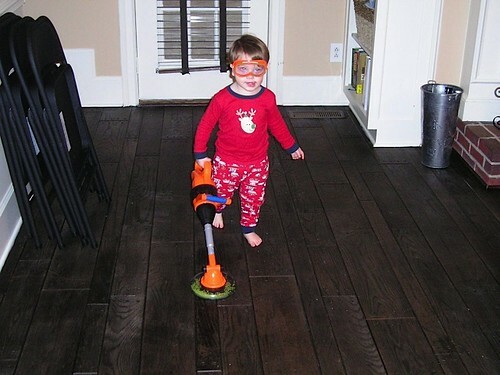 He asked for this “wee-do” (also called a weed eater to those of you who are picky about pronunciations) and he played with it all winter and spring. 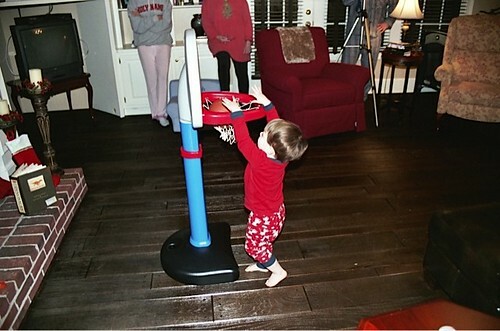 Santa was very gracious to bring him a basketball goal as well. 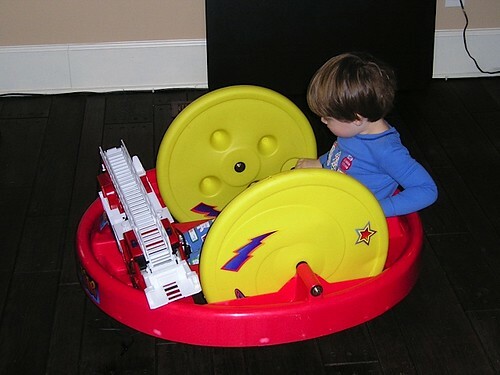 As Joseph’s requests have always been quite simple, the next year all he wanted was a standard issue red fire truck. Santa did deliver! He also brought a Rheneas roller coaster train set as well as some cool building blocks. 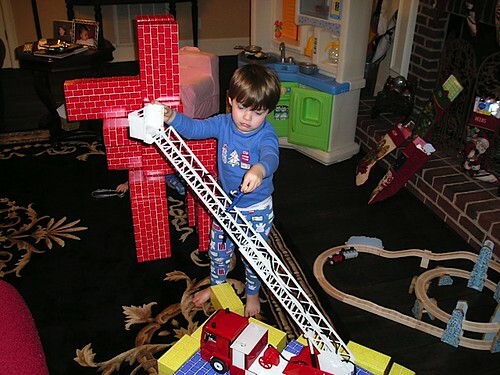 The fire truck was the hit of the next eighteen months. 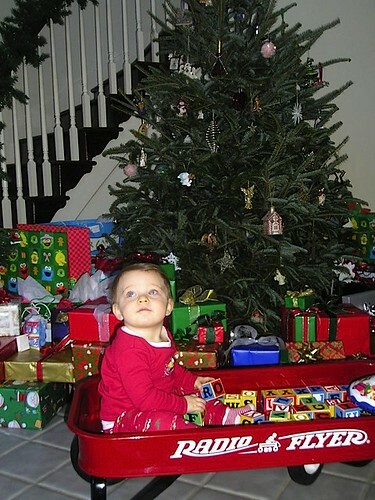 The kid knows what he wants. 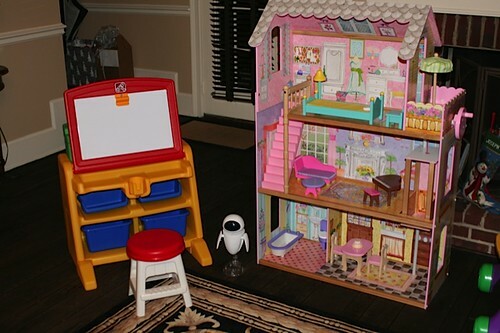 Belle, a new addition that Christmas, got a kitchen set (seen in above picture), a pink chair, and this outdoor wheelie toy (fire engine not included). In 2007 we had another addition to the family, but she was brand, brand new. 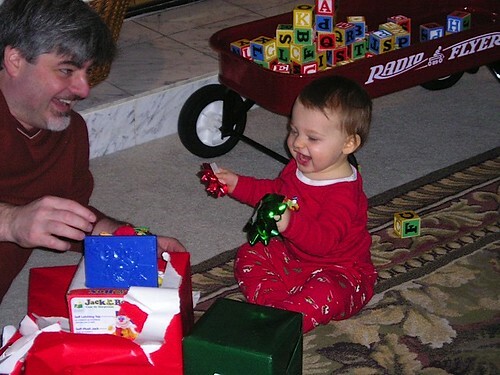 The big kids were surprised to find that Santa does, in fact, visit 5-day old children! 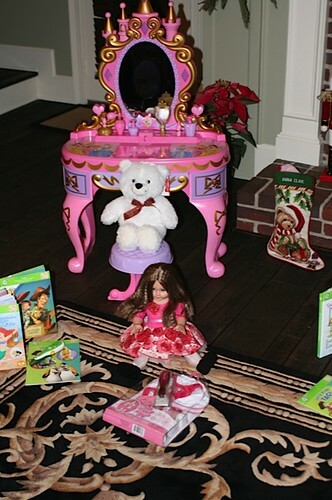 Anna Clare received an interactive blanket, a stacking ring toy, and a stuffed elephant. Belle got two riding toys and an Elmo computer, none of which worked by spring. 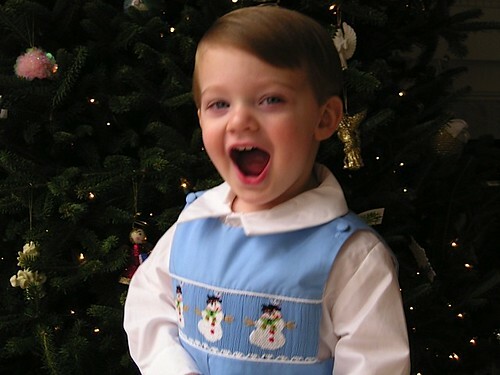 Joseph, a big Toy Story fan that year, was shocked to find the actual Toy Story remote control car with Buzz Lightyear. Plus he got a Leapster and a Chalktracker truck. Buzz only recently was stowed in the toy trunk for safekeeping. Belle gave this easel a full workout only minutes after seeing it. 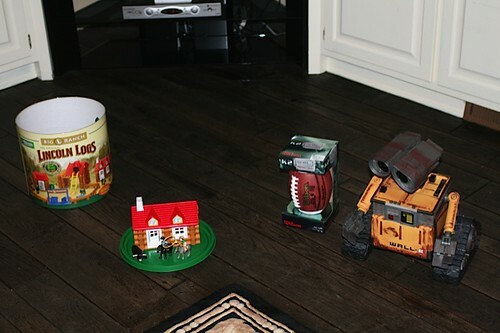 The dollhouse was a marginal hit, and Eve (to go with Wall-E) was actually the only thing she wanted for Christmas. 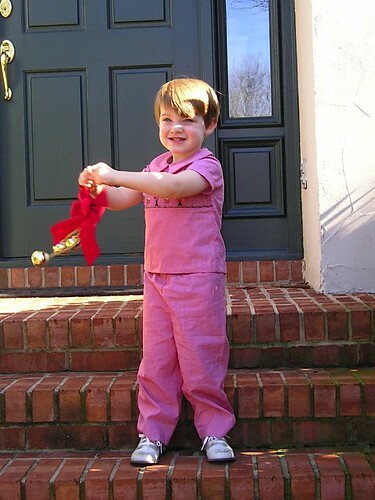 Unseen are Anna Clare’s 2008 gifts: a riding toy, a walker toy, and a musical instrument set. 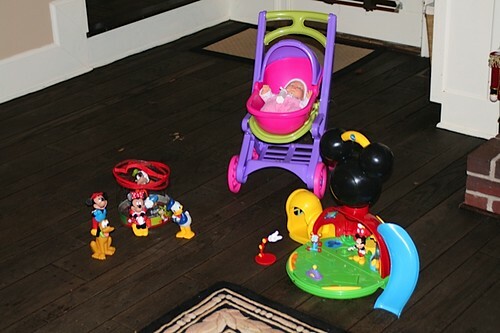 Anna Clare had not asked for anything in 2009 but is still absolutely crazy about Mickey and friends, and the Disney toys seen below are still her very favorite toys. Amazing. For Joseph 2009 was year of the Legos. And Star Wars. And cars. And Santa brought a gift in each category. These have all three proven to stand the test of time in this house as well. Great classics. 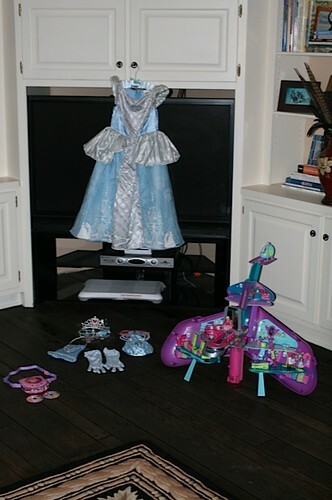 In 2009 Belle wanted a Cinderella costume, deluxe set. When she saw it, she nearly cried. She barely played with her Polly Pocket fully outfitted Jet set or Disney listening discs. 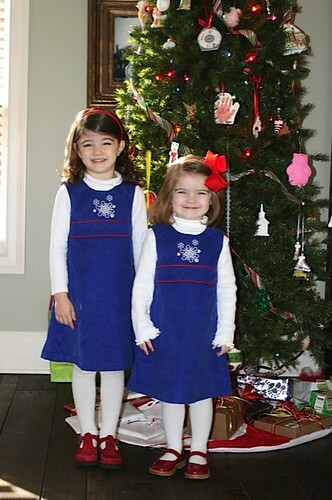 Last year, 2010, both girls got American Girl style dolls and Leaptag books. All Anna Clare had asked for was “a polar bear” so she got one, but is was sort of just an accessory to some other toys with more lasting power. Since Belle was getting a doll, Anna Clare got a friend for her doll to play with. The vanity was a fun addition as well. Belle’s third gift was a Cinderella castle set. 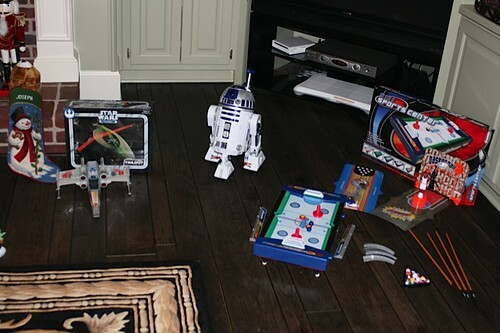 Joseph’s gifts were Star Wars-themed. 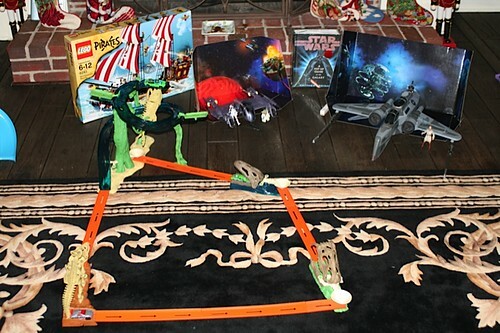 He had asked for the X-wing fighter and Santa found it (barely). R2D2 was a great “real robot” and a genuine surprise. The game table was a fun surprise also, and a great idea for when friends come to play. Clearly, three gifts are plenty. 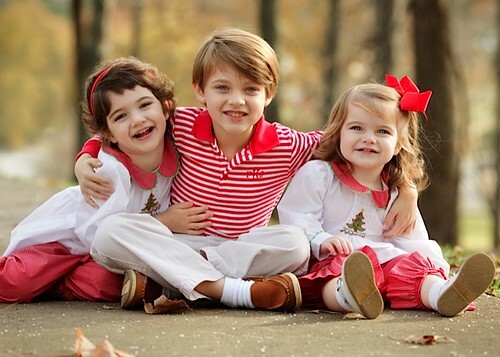 And when there are three children, three gifts per child make even more plentiful gifts. Add to that a stocking per child, plus gifts between siblings, plus gifts from both sets of grandparents, parents, and friends, and you’ve got more gifts than the children can play with before next Christmas! When the wisemen gave their gifts to Jesus, they gave sacrificial, large gifts, out of the generosity of their hearts, as a way to show their appreciation and love for the joy they felt about this newborn who would become their king and savior. When we give gifts, we should give in the same spirit, and when we receive them, we should receive them graciously, without expectation, and with a sense of kindness and love, for we are sharing the same joy that beheld the wisemen so long ago. It’s Thanksgiving night and that means it’s time to begin the Advent season in our house. One of our favorite parts of the season is preparing the Christmas tree. This is usually the very first thing we do the day after Thanksgiving. Although we put up several trees for various rooms in our home, we carefully and thoughtfully select a live tree for our main tree. It is usually a Fraser Fir and it fills our home with the aroma of winter. Lovingly wrapped gifts are heaped beneath the tree for every person we can possibly remember during the season. We decorate this tree with special ornaments, many of which have been given to us by special friends. Choosing the tree is a main event to start the Advent season, and it starts the very minute we have cleaned the Thanksgiving turkey leftovers off our plates. 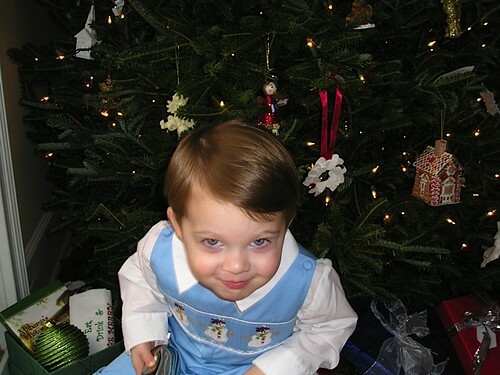 In 2004, Joseph’s first tree was in our rental house in Huntsville. 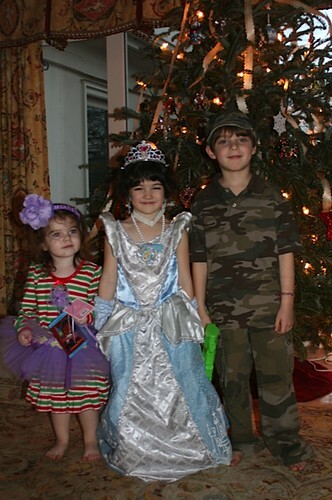 Since that time, we have tried to get a picture in front of the tree at some point during the season. 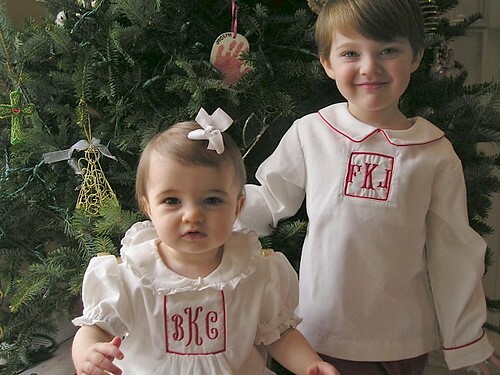 In 2005, I decided to combine the tree tradition with another of our favorite traditions, Christmas greeting cards. I thought it would be a most fabulous idea to take the now-annual tree-shot and make it our Christmas greeting card. 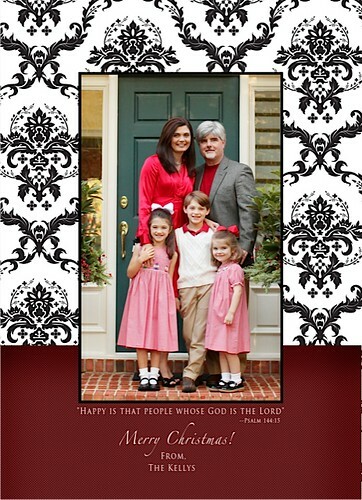 We so look forward to getting Christmas cards during the Advent season, and we have always looked forward to the day when we could share similar joy with our friends and family near and far. 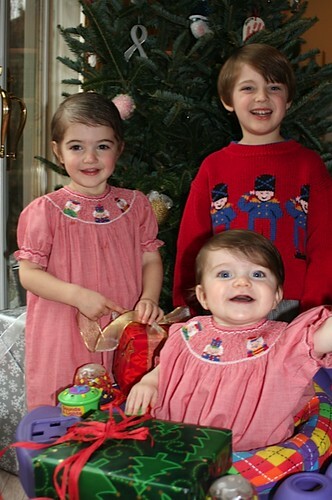 What better way than to put the tree photo as our Christmas card picture? …or would disassemble the tree, one ornament at a time. And, seeing that we had a little sister involved this year, he was pretty proud to show her off once we settled down and came inside. Thank goodness for the year 2006. In 2007 things were not so easy. We had to nix the tree shot. 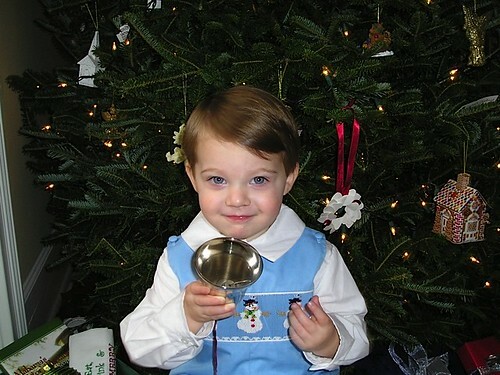 Ornaments were flying. I was pregnant with our third baby and I just really couldn’t fight the battles like I used to. I gave them an activity and didn’t even care that they weren’t looking at the camera. At least they weren’t crying, fighting, or dismantling the tree. Not perfect, but it would have to suffice. However, I learned a very important lesson: Call a professional. We hope it brings them — and you — much joy this holiday season.